This moderate wide-angle lens is based on the renowned Distagon design of the 1980s for the Contax system. The modern Distagon T* 2/28 has been optimized with current, higher performing and eco-friendly glass and incorporates a fl oating lens element design to optimize image quality across the entire focusing range. A compact lens for its speed, the fast f/2 aperture allows for hand-held photography under diffi cult lighting conditions and is well-suited for landscape, nature and commercial photography. The Distagon T* 2/28 is available with the F bayonet (ZF) and K bayonet (ZK) lens mounts and is designed for use with full-frame SLR and DSLR cameras. 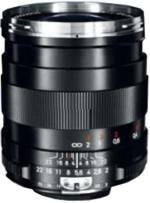 Combined with a DSLR with a 1.5 crop factor, the lens has an effective focal length of 42 mm.